I almost never buy an item of clothing at full price. I really mean almost never! I can't remember the last time it happened! I usually hit the clearance rack, the sale rack or the thrift store! Most of my wardrobe (and in fact, most things in my home) have come off of the clearance rack or from the thrift store/rummage sale/hand-me-down. I would estimate that I have come by over half of my wardrobe secondhand. 14 items purchased on 1 trip to the thrift store. Could there be any better reason than that? 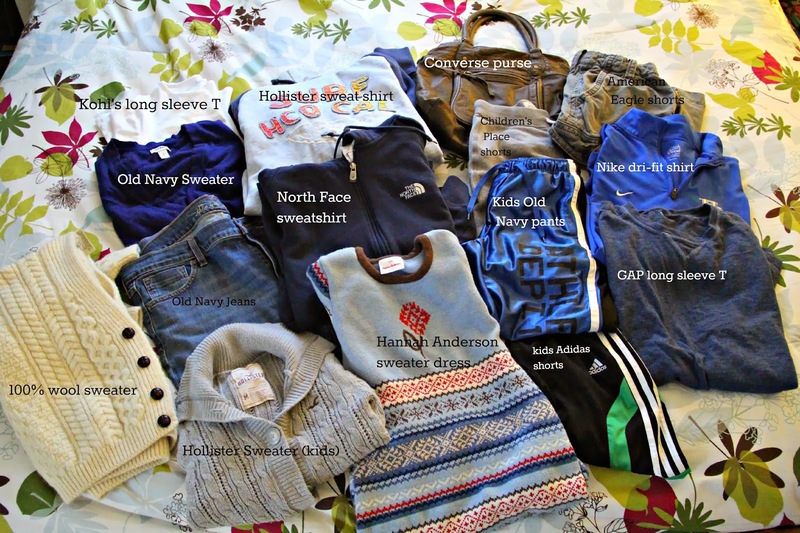 Also, I am not afraid to admit it, but when I shop second hand, I am a brand snob. I look for the best quality items that I can score at the best price. I admit to passing over a perfectly good item if it is from a store where I could have gotten it brand new on the clearance rack for as cheap as (and sometimes cheaper) than the thrift store is selling it for. At least 6-7 of these items would have cost more alone, than what I paid for the total cost, if I had bought them brand new at the store. I might be a brand snob, but I am also careful about what I buy. I have learned a few lessons the hard way. *1-Look over each garment carefully, you want to look for holes, stains and tears. Two problem areas are pits and seams. *2-Give it a sniff test - you don't have to get too close, anything that smells really funky might not come clean in the wash.
*3-Check zippers and buttons to be sure they work. *4-Try things on. Sizes are often 'off' because they have shrunk. *5-If it looks worn - pass it up. *6-Take your time. You really have to search through those racks and piles. *7-Know your brands. You don't want to spend $5.00 on a 2nd hand shirt from Wal-mart but that wouldn't be a bad price on something from Anne Taylor, Lands End or J Crew. I find the best deals at rummage sales and small town thrift stores. The chain thrift stores tend to be over priced. I can often find an item cheaper on the clearance rack at the original store than the price the chain thrift store is selling it for, depending on the brand. I get some of my best deals on shoes when I am willing to buy used. Real leather shoes are expensive! But they are better made and more comfortable. I have never contracted a fungus from buying used shoes. Be careful though, if the interior sole has a significant imprint, leave it on the shelf no matter how cute it is, it will only cause you pain in the long run. But don't worry, I don't always buy used. Besides, there are some items that you don't want to buy used. If I can get a great price, I am not going to pass up something new just to buy something used. So, when I am shopping at the retail stores, I love the end of season clearance sales. Some stores send out coupons and others mark their clearance an additional percent off at that time of year because they are looking to get rid of it all. Out with the old, in with the new you know. Good months to look for these sales are January and July. I admit that thrifting can take more time than going to a retail store and buying new off of the rack. You have to be willing to really search through those crowded racks. However, I often say that I have more time than money so it often pays off for me to spend time searching the thrift stores and clearance racks. Thrifting is also a great way to recycle and keep items out of landfills. My absolute favorite way to get new clothes? Hand-me-downs from friends or family of course! I know some of you are thinking that I must wear some pretty homely and outdated clothes. I can't really convincingly testify for myself but you can ask my friends and family what they think. I get a good amount of compliments from my girlfriends and most of the items they compliment me on are my 2nd hand items. When someone asks me where I got my cute shirt/shoes/pants/or whole outfit I love being able to tell them "Oh this? I picked it up at the thrift store." I know, there is a lot of junk out there, and there are many hideous things that no one should wear. But, there are a lot of people that get rid of some really nice things! I've even bought many items with the tags still on them. Thrifting gives me the opportunity to have a more expansive wardrobe with better quality items. I am able to purchase things I wouldn't be able to afford if I had to pay full price. So there you have it. My big secret is out. Now you know why I love thrifting. If you've never tried thrifting, give me a call, I'd be happy to go with you and give you some pointers. I think you'll like what you find!